If you're happy and you know it, beep along! ALICE SCHERTLE is a poet and the author of many well-loved books for children, including Little Blue Truck, Little Blue Truck Leads the Way, Little Blue Truck's Christmas, Button Up!, and All You Need for a Snowman. She lives in Plainfield, Massachusetts. My young family sure did enjoy this interactive read along book. Each page has a very sing-along chime to 'if you're happy and you know it, clap your hands'. 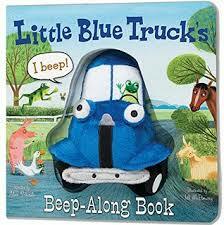 My two year old son most enjoyed his chance to beep-along, and point out the many farm animals Little Blue Truck passed along on his drive. My four year old also enjoyed her chance to beep along. Overall, if I were to suggest this book to families with young children I certainly would. This adorable read gets two thumbs up from all of us! I would appropriate this book for a child 18m-3yr, when they're most interested to sit and participate with a short story.